Use the form below to inquire about Eco Lodge At Monnangeri . Use the form below to reserve for Eco Lodge At Monnangeri . Unwind at this Eco Lodge at Monnangeri in Coorg, a wooded plantation bordering the dense forest. 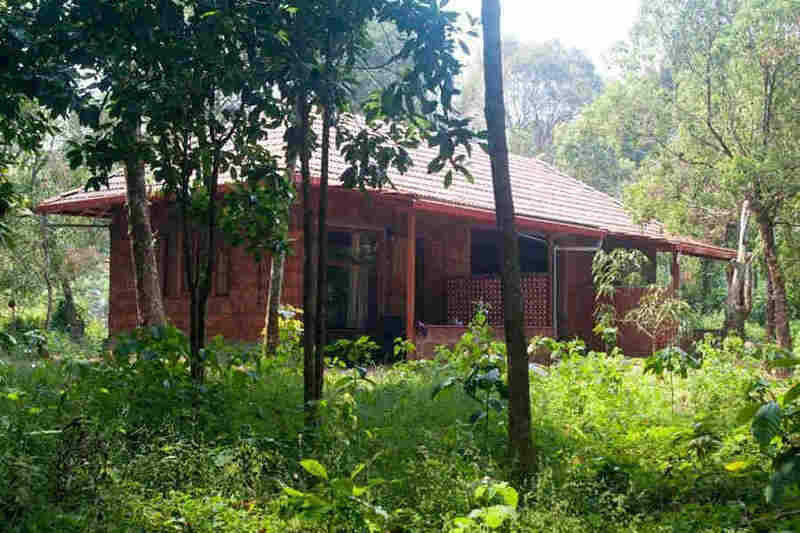 Situated at a distance of 8 km from Madikeri, this Eco Lodge at Monnangeri sits amidst a serene plantation. The misty woods surrounding the property are home to a variety of bird species and feature quite a few easy walking trails. The lush greenery all around offers a soothing sight to eyes used to a dreary cityscape while the melodious tunes of the birds calm frayed nerves instantly. Boasting of its own weather station, this quiet Eco Lodge at Monnangeri has an open kitchen to cater to all your meal requirements. So, any time you feel like having a hot cup of tea or coffee just walk in and ask for it. Or maybe, you would like a quick snack to hold you till mealtime after that stroll across the property. There is also a small library with a good selection of books for you to choose from alongside a good selection of board games to keep everyone busy. The hammocks gently swaying in the breeze invite you to spend some time contemplating in solitude. Bonfires are held in the evenings providing you with ample opportunity for some much-needed bonding while barbecues are the perfect way of enjoying some tasty delicacies. This quaint Eco Lodge at Monnangeri is a small cottage featuring two spacious non-smoking bedrooms that can accommodate up to four people in a room. An attic tucked away in each room houses an additional bed making it convenient for small families to be together. Both rooms in the cottage are connected by a small veranda. A privacy screen partitions the veranda ensuring both rooms have a cozy sit-out each for you to curl up with a book or some music. All in all, a secluded retreat far from the madding crowds to relax and rejuvenate in! The lodge is pet-friendly and welcomes pets at a flat charge of INR 250 per day. Pets are allowed provided that they stay off the furniture and linen and the owner ensures their safety and the safety of other guests at the homestay. Early mornings or evenings are the best times for some bird watching on the sprawling grounds. Then you can pick out a book from the small library on the premises and enjoy reading it in the privacy of the patio attached to your room as you sip a warm beverage. You can also enjoy an afternoon of bonding with family over some board games before you head out for a stroll across the property. Then sit around a bonfire as night falls and watch the tiny little glowworms flit around. Nishani Betta Peak and Koot Holey Lake are close by if a short hike is what interests you. The Bhadrakali Temple and the Deverakadu forest surrounding it are also interesting places to explore. Enjoy the beauty of the gushing Abbey Falls located only 10 kms from the property and check out the hanging bridge there. Mercara Fort, dating back to the 17th century is worth a visit and great for a step back into history. Madikeri town can be explored on foot and you can make stops at the shops to take home some spices, organic honey, and freshly ground coffee powder. Mangalore International Airport is the closest at 150 km while Calicut International Airport is about 222 km away. Kempegowda International Airport, Bangalore, is at a distance of 295 km. Mysore railway Station and Kannur railway Station are each 125 km from Madikeri while Bangalore railway station is around 220 km away. Madikeri town is 8 km away, while Bangalore City is at 255 km. The coastal city of Mangalore is at a distance of 145 km and the royal city of Mysore is a mere 125 km away with NH275 connecting all three to Madikeri.